This highly political process of redrawing lines focused on maximizing the political opportunities for those in power, or the majority party. Although there were public hearings around the state, these hearings were held before the maps were unveiled. Once the public had the opportunity to see proposed maps, the Legislature and the Apportionment Board quickly passed them, allowing little time for public comment. Instead of voters choosing their politicians, politicians are choosing their voters. Our politicians hid out in backrooms to draw districts that benefit themselves — to ensure their own re-elections and over-represent their party. In order to gain political advantage, they have created bizarre districts that split apart cities and counties. (See map on other side.) They have rigged the system to create “safe” districts that prevent voters from holding them accountable. Nonpartisan, good government organizations in Ohio, including the League of Women Voters, Ohio Citizen Action, ProgressOhio, the Ohio Education Association and Common Cause/Ohio, have proposed a constitutional amendment that would reform Ohio’s redistricting process. With enough support this issue can be on this November’s ballot, so that Ohio’s voters can decide. • Politicians will no longer be able to draw their districts. Instead an Ohio Citizens Independent Redistricting Commission, consisting of 12 qualified people, will determine our districts. Politicians, lobbyists, and other political insiders will not be permitted on the commission or to choose who is. • The Commission will be non-partisan with four Republicans, four Democrats, and four voters not affiliated with either party. New districts will require the approval of 7 of the 12 commission members. Districts cannot be created to favor a political party, incumbent, or potential candidate. • No more backroom deals! All commission meetings and records, including proposed plans must be public. The commission must consider plans submitted by the public and must provide the public with an opportunity to review and comment on proposed plans. To move forward, we need to identify sufficient resources to gather 386,000 signatures by July 3, 2012 and mobilize a statewide educational campaign for the Nov. 2012 election. Email us at feedback@uaprogressiveaction.com and we will tell you where can find a convenient signature gathering location. • Help to collect signatures to put this initiative on the November ballot. Send an email to: feedback@uaprogressiveaction.com and we can get you set up with a petition and show you how to effectively collect signatures. • Support this effort by contributing to UAPA’s Redistricting Fund. We will match every dollar contributed to UAPA between now and June 1st, up to $2000, and send these dollars on to help fund the extensive campaign costs. Simply log on to our website and click on the “Redistricting” tab at the top right to make a secure, online PayPal donation. The picture tells the real story. 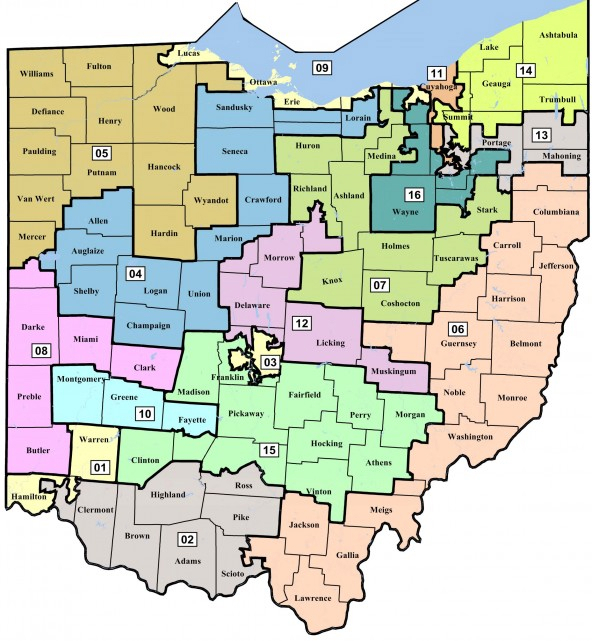 As you can see at the right, the Ohio congressional map looks like a crazy quilt of districts that are not compact, which split apart cities, and combine geographic areas that simply make no sense. This map represents gerrymandering at its worst. For example, our 15th congressional district includes Upper Arlington, Athens, and Wilmington. These three cities are vastly different from one another with their own unique concerns. District 9 runs from Cleveland to Toledo and extends into Lake Erie. District 7 is shaped like a “U.” And the greater Cleveland metropolitan area is divided into five districts. This convoluted map was drawn not to benefit voters but to benefit politicians in power. And regardless of your political preferences, this is wrong and needs to be fixed now. Please be generous with your time and financial support to ensure fair elections in Ohio for all future generations. 2134 Oakmount Road, Columbus, OH 43221.